Two San Jose lakes were closed Thursday and remain closed because algae found in the lakes can kill dogs, city officials said. Lake Cunningham and Almaden Lake were closed because of elevated levels of cyanobacteria, a toxic blue-green algae. 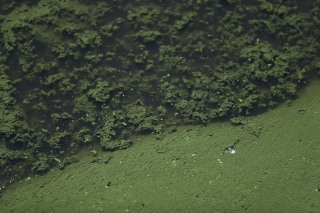 The algae causes only skin irritation and intestinal issues in humans, but it can kill dogs, according to officials with the city's Department of Parks, Recreation and Neighborhood Services. The closure will also affect boating, recreational fishing and San Jose State University classes. Swimming was already prohibited. Even though the lakes are closed, the parks where the lakes are located are open, city officials said. All lakes contain bacteria naturally, but state guidelines require city officials to close lakes when bacteria exceed recommended levels. City crews will test the lakes at least two times a week. The lakes will reopen when the bacteria have been at safe levels for two weeks. Dangerous algae have also been found recently in Lake Anza in Berkeley and in waters around Discovery Bay in Contra Costa County. Cyanobacteria grow faster and thicker when lakes are low, temperatures are high and bacteria can feed on nutrient-rich runoff. More information about cyanobacteria can be found at California Department of Public Health website.